"Easy to talk to and they take the time to explain things that pertain to your health!" "They not only fixed the problem I was having, but took the time to explain it to me." McKenzie Medical Associates has over 35 years of combined experience in both medical practice and acute hospital care settings. Our practice was established in 1991 with the goal of providing a patient and family oriented care. We have committed to treating each patient as if she/he was a member of our family, and will continue to provide high quality and patient-centered care. We believe that when patients are involved in their care stay heathier and have better management of their conditions. At McKenzie Medical Associates, our mission is your health! We are a state-of-the-art medical practice catering to the health and medical needs of men and women from Fort Lauderdale, Florida and the surrounding region. Conveniently located at 1625 SE 3rd Avenue, the practice provides patients with a comprehensive array of care options, including annual physicals and other preventive care, ongoing management of chronic diseases and conditions like diabetes, hypertension, and asthma. McKenzie Medical Associates also offers treatment of acute illnesses and symptoms like flu, strep throat, edema, chest pain, and kidney stones. For your convenience, we offer in office ultrasounds, Echo, breathing treatment, and other services. 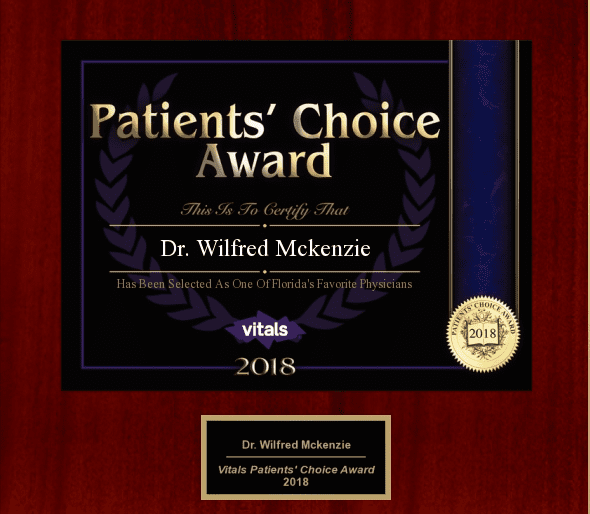 Led by Dr. Wilfred McKenzie and Dr. Rona McKenzie, the team at McKenzie Medical Associates is focused on providing patient-centered care that’s individually tailored for each patient’s specific and unique needs. With extensive training in internal medicine, both doctors are board-certified, and each offers more than 20 years’ experience treating acute and chronic medical issues. In addition to providing state-of-the-art treatment and a compassionate approach to care, both Dr. Wilfred McKenzie and Dr. Rona McKenzie are dedicated to ensuring each patient receives the information they need to understand their medical issues, so they can take a more proactive role in their health and feel more confident in every aspect of their care. The practice welcomes new patients throughout the Fort Lauderdale, Florida, area, and most major medical insurance plans are accepted. Call today to schedule your appointment. We also offer OB/GYN care! Book an appointment at our other location, Fort Lauderdale Women Care, for OB/GYN related services. We accept most major insurance plans. Please call our office with any questions, we are happy to help you! Please note: we accept all Blue Cross Blue Shield plans EXCEPT MY BLUE.